The first step in divorcing your incarcerated spouse is filing a complaint for divorce with your local circuit court. In this complaint, you must list your grounds, or reasons, for seeking a divorce. Alabama recognizes both no-fault and fault grounds. Imprisonment is one of the many fault grounds available. This means you can cite your spouse's imprisonment as the reason for your divorce. To qualify for this ground, your spouse must be imprisoned, in or out of state, for at least two years and must be serving a sentence of seven years or more. If your spouse's imprisonment is not the reason for your divorce, or you don't want to use this ground, you can choose another fault ground, such as adultery or substance abuse, or one of the state's no-fault options, which include incompatibility and irretrievable breakdown of the marriage. After you file your divorce complaint, you must serve your spouse with a copy, along with any other required court paperwork, which informs him of the impending court action and the steps he must take. In Alabama, you can serve a spouse in a number of ways, including certified mail, delivery by deputy sheriff or private process server, or acceptance at the court clerk's office. Since your spouse is incarcerated, contact the prison where he resides to determine if there are any internal rules you must follow when serving him. Although Alabama law permits service through a variety of methods, the prison may have certain restrictions on service. For example, the prison might require that the local sheriff's office serve all complaints and direct them to a specific prison official. Once your spouse files an answer to your divorce complaint with the court, which he must do within 30 days of receiving the divorce paperwork, the court schedules a hearing, usually a few months in the future. At the hearing, the court will resolve any contested matters, such as those involving property division, child support and custody, and alimony. 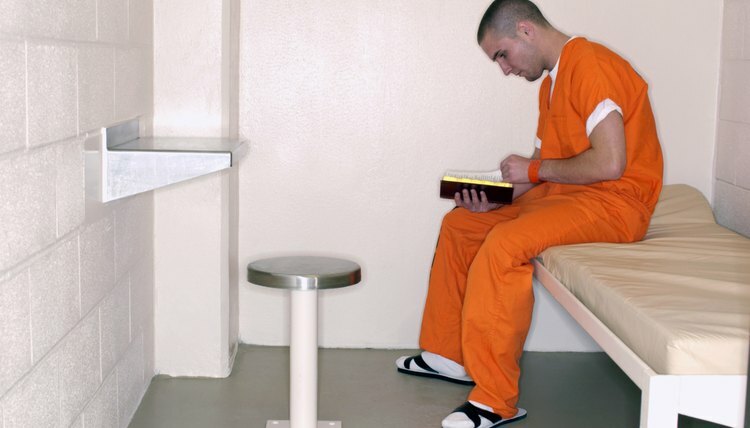 Since your spouse is incarcerated, an attorney might represent him at the hearing. However, if you and your spouse are in agreement on every issue, the court will deem your case uncontested and a hearing will likely be unnecessary. Instead, you and your spouse will submit your agreed-upon marital settlement agreement to the court for review. Upon approval, the court will finalize the divorce and incorporate the terms of your agreement into your divorce decree. If your spouse fails to respond to your divorce complaint and any subsequent notices, you will receive a divorce by default and likely receive everything you requested in your initial complaint for divorce. If your case proceeds to a hearing because there are one or more contested issues, the court will have the final say once both sides present their cases. Your spouse's incarceration is not likely to be relevant to most of these matters, with the exception of child custody. Like all states, Alabama courts make custody and visitation determinations based on the best interests of the child. Alabama recognizes both legal custody, which is the right to make decisions concerning a child's upbringing, and physical custody, which is the right to provide a home for the child. Since your spouse is incarcerated, the court is likely to award you sole legal and physical custody of your child. When deciding whether or not to grant your spouse visitation rights, the court will evaluate several factors to determine if it is in you child's best interests, including your child's wishes, emotional needs and your child's relationship with the incarcerated parent.